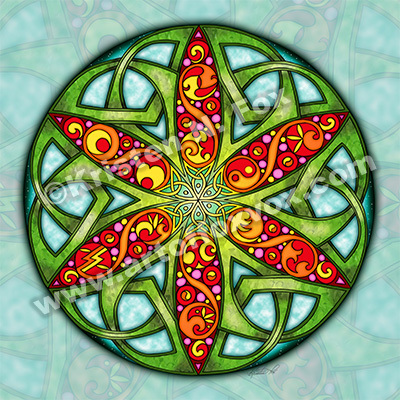 My new (ahem) Celtic Summer Mandala has a six-petal flower of bright red, yellow, orange, and magenta Celtic spiral art, and is framed by a nest of Celtic Trinity Knots like green summer grass and leaves. The edges of the mandala fade off into a deep blue summer night sky, twinkling with stars. It may be a little late in the season, but think of this design as a way to stretch summer out a bit longer – hah! Click here to see our entire selection of Celtic Summer Mandala apparel and gifts! Decorate the Walls… Through my gallery at Fine Art America, you can hang some colorful Celtic Summer Mandala Art on your wall – these fine art prints come on gallery-style canvas, as framed or unframed prints, acrylic prints and even metal prints! For the Home… The Celtic Summer Mandala design is also available in products for the home, including bedding, pillows, window curtains and shower curtains – check out the many ways to add some summer feel to a room, even when it’s not summer….